Moving is an expensive venture--even if you are only moving locally! While your moving-related bills may seem sky-high, there are a variety of ways to cut costs and keep your relocation within your desired budget. If you need some help saving money on your upcoming local move, read on for tips to find affordable movers, pack your goods and plan properly to keep costs at a minimum. Local movers charge by the hour, not volume of your goods. However, the more boxes and furniture you are moving, the longer it will take to load up the truck and unload it at your new home! The best way to streamline your move so it's completed quickly is purging your useless junk that clutters up your home. Gather your outdated, tattered clothing, broken and forgotten toys, and any unnecessary novelty items that simply collect dust. Donate unwanted items to charity or pass them along to family friends. To make a little extra money for your moving budget, you could hold a yard sale or sell your items online. Anything not worth selling or donating? Simply toss it out--or recycle it properly if you can. 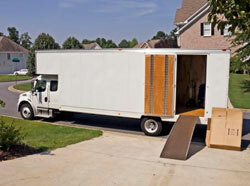 Planning your move at least several months in advance can help you reduce your costs. If you book movers last minute, they may charge you higher rate. Plus, the more time you give yourself to search for a mover, the easier it will be to find one with a great price! Not all moving company rates are created equal! You should always receive at least THREE in-home estimates before hiring any company to get the best price and service for your move. Never trust a company that offers only a phone estimate--they must send a surveyor to your home to provide an accurate quote. Make sure you get your estimate in writing--whether it is binding, non-binding, or binding-not-to-exceed. Though the benefit of comparing rates from several companies is saving money, be wary of any company that offers you a drastically low quote. This is often a red flag for a common moving scam conducted by rogue movers. After you hire the company based on an enticing low price, they will hike up the cost exponentially on your final bill, then refuse to deliver your goods until you pay. Always shop around to find a great price, but if a quote sounds too good to be true--it probably is. Nobody likes packing--just the thought of sorting through your belongings, carefully wrapping each item, and taping up box after box can be overwhelming. However, movers can charge between several hundred and several thousand dollars extra for professional packing. You will save a significant chunk of money if you forgo packing services and handle the daunting task yourself. Additionally, you may want to disassembly and wrap your own furniture to save some money as well. Make sure you know what you are doing before attempting to tackle the task of taking a bunk bed apart or wrapping a leather sofa for protection. If you have a large amount of fragile glassware, antiques, artwork, or other valuable items, you may consider enlisting movers' assistance with packing and wrapping just these items. Since local movers charge you by the hour, making sure everything is ready to go when they arrive will keep the move short and sweet. Have everything packed and ready by the door. If you can, disassemble and prepare your furniture before the movers arrive--the less they have to do, the less you will pay. certain appliances, like washers and refrigerators, require special preparations before you can disconnect and move them. If you are unsure how to handle this, ask a knowledgeable friend or relative to assist you before the movers arrive. When you receive the estimate from the moving company, you may want to inquire about the route they expect to take to your new home to ensure they are planning the quickest trip possible. Suggest any short cuts you know and tell them which traffic-clogged roads to avoid. Once you have all of the pertinent information about extra fees, you can plan to handle some of these tasks yourself. Find free moving boxes, have friends help you carry your furniture and other items downstairs (or up from the basement), disassemble your own furniture and disconnect and prepare your own appliances. Just be sure you know what you are doing, take all the proper precautions, and enlist help from knowledgeable friends. Even if you opt to pack all of your own goods, professional packing supplies can be costly. You can eliminate a huge moving expense by using free supplies to wrap and protect your belongings. Get free boxes. Rather than spending hundreds of boxes from moving supply retailers, you can find free boxes in a variety of places. Grocery, liquor and book stores will have plenty of sturdy boxes on hand after they remove their stock. You can also get used moving boxes on Craigslist, Freecycle, or the U-Haul Box Exchange. Use blank newsprint. Instead of buying packing paper to wrap your items or stuff your boxes as filler, you can use blank newsprint. It won't leave ink smudges like regular newspaper. Use blankets and linens. You can use old quilts to wrap furniture, and linens or towels for extra cushioning in your boxes. Small towels can also be used to wrap plates and other cookware to prevent damage during the trip. Peak moving season lasts from Memorial Day to Labor Day and movers will often charge a summer premium due to the high demand. If you have the luxury of choosing the time of year you wish to move, you can save a substantial amount relocating during off-peak season. Plan your move during the fall or winter to get lower rates. 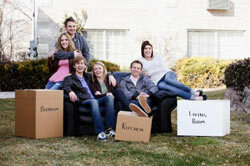 Ready to start comparing rates from local movers near you? Simply fill out our fast and easy quote form, and receive up to seven FREE, no-obligation quotes from reliable local moving services in your area today! The more you compare, the more you can save!